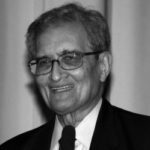 The foundation is named after Amartya Sen (1933), a well-known Indian economist and philosopher who currently teaches at Harvard University. Amartya Sen (1933, India) is a Nobel Prize laureate in economics for his scholarly work in philosophy and economics aimed at freedom and poverty reduction. His works have been distributed in over 30 linguistic areas. In 1981, Sen demonstrated in Poverty and Famines: An Essay on Entitlement and Deprivation that famines are not necessarily a result of food shortages, but that they are mainly caused by poverty and inequality. In Development as Freedom (1999), Sen argued that eliminating the lack of freedom is essential for development. He thereby redefined positive liberty as having the opportunity to make personal choices which are necessary for self-development and survival, and negative liberty as the absence of restrictions by others on personal means for survival. Partially thanks to his efforts, the annual Human Development Report of UNDP was established, which no longer determines the countries’ ranking by average income, but by an index of longevity, education and spending power.In his most recent book The Idea of Justice (2009), Sen contended that a righteous society is accomplished by eliminating injustices such as poverty, hunger, and political oppression. Notwithstanding his advanced age, Sen is still travelling the world, lecturing and inspiring many.